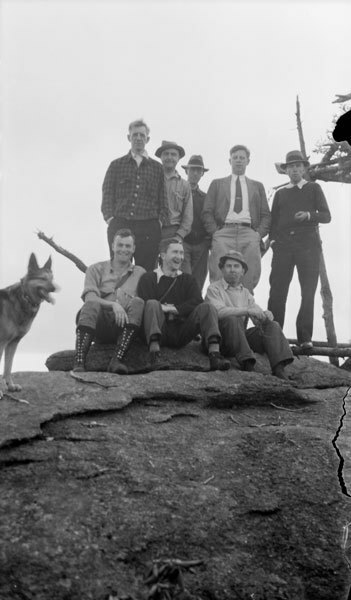 A group of hikers on the summit of Roan Mountain in North Carolina, May 6, 1934. The group includes, from left to right in front, Sonny Morris, Harvey Broome, and Albert Gordon "Dutch" Roth. From left to right in back, Benton MacKaye, Guy Frizzell, Mack, Fred Shelly, and Marshall Wilson. Roan Mountain is the high point of the Roan-Unaka Range of the Southern Appalachian Mountains and is the last point above 6,000 feet for northbound thru hikers. Albert Gordon (Dutch) Roth, 1890-1974, “Gang on top of Roan Mountain,” Appalachian Trail Histories, accessed April 23, 2019, http://appalachiantrailhistory.org/items/show/437.